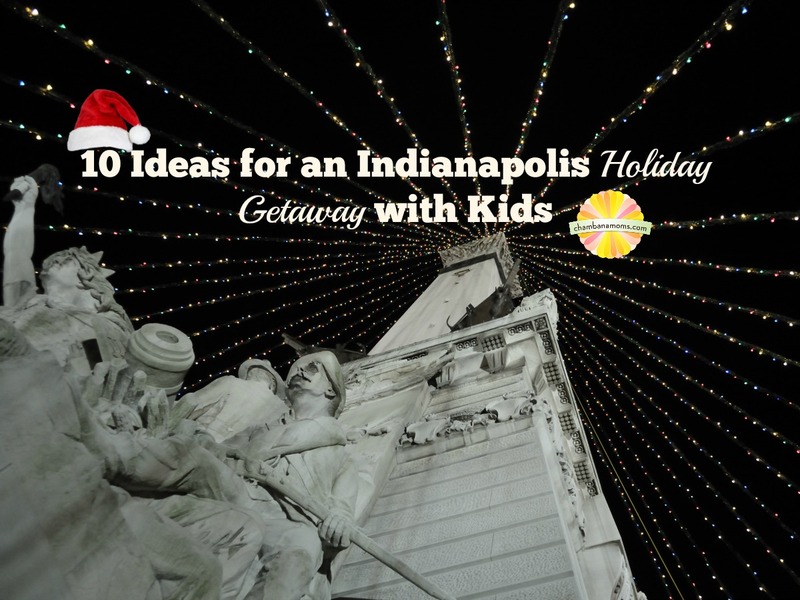 The Indianapolis Children’s Museum is a great place to visit over the winter holidays. Photo shows a temporary exhibit, unfortunately not at ICM anymore! Chambanamoms photo. Jolly Days Winter Wonderland at the Indianapolis Children’s Museum: What’s there to say about the ICM? See our recent review, but know that during Jolly Days Winter Wonderland includes a Yule slide, visits withSanta, “snowball” fights, characters, ice “fishing” and much more. Bonus: if you need to do some holiday shopping, this place has a great gift shop, and doesn’t have the markup issue of other museum gift shops. Jolly Days goes from Nov. 24 to Jan. 7. Regular admission fees apply. Jingle Rails at the Eiteljorg Museum, downtown Indianapolis: The Western-themed Eiteljorg Museum comes alive during the holidays. Jingle Rails: The Great Western Adventure is a journey to the Great American West – the real West and the West of the imagination. The popular locomotive wonderland is an Indianapolis family tradition. 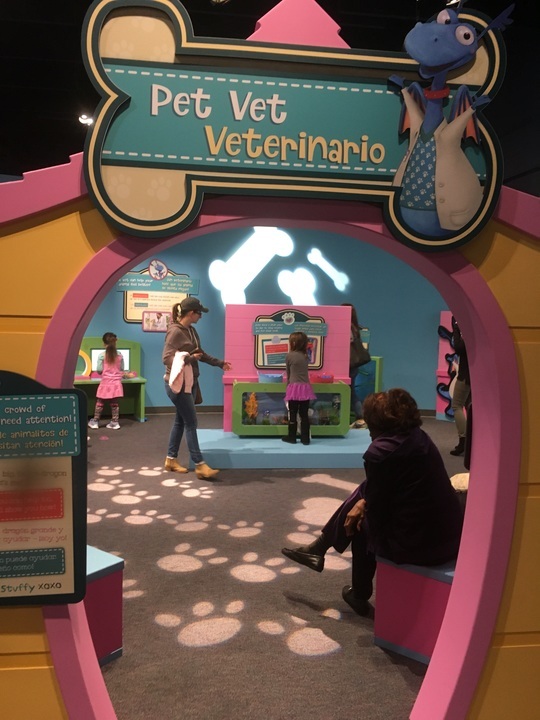 This museum has a family-friendly, hands-on exhibit in the ground floor, complete with a few “horses” and a stagecoach you can climb into and take a family pic. You can even build your “own” totem pole. From Nov. 19 to Jan. 15. A bonus: kids 4 and under are free, and this museum validates parking in the lot underneath it. Conner Prairie, Fishers: We raved about Conner Prairie when we went in 2015. It’s one of the unique destinations for families that truly appeals to all ages. There’s something for everyone, whether it’s engaging with the reenactors, doing crafts, petting the animals or doing hands-on STEM learning (without realizing it). At the holidays enjoy “Holidays on the Prairie” with special opportunities to dine with Santa, see the Gingerbread Village, and more. Select dates between Nov. 24 and Dec. 31, so check the website. Lights at the Brickyard: You’ve never seen the Indianapolis Motor Speedway like this before, because well, it’s never happened. This is the inaugural year for this lights display, which hopes to become a tradition. Head to the Brickyard between 6 and 9 p.m. Sunday through Thursday and 6 to 10 p.m. Friday and Saturday nightly now through Dec. 30 and see 2 million lights over 400 displays – as holiday light shows go, it’s “massive and impressive.” Admission: $25 per car on Mondays through Wednesdays. $30 per car Thursdays through Sunday and $50 for vehicles with 15 more passengers on all days. Indianapolis Zoo: No it’s not free like St. Louis or Lincoln Park, but we happen to love the Indy Zoo. One of the main attractions is the dolphin show (which is included in the admission fee). The newish gorilla exhibit is a lot of fun, not to mention very educational about the importance of conservation. During Christmas at the Zoo, enjoy the special evening lights display that’s been nominated as one of the top best in the United States. Check dates, but generally November 24 – Dec. 30. Shapiro’s Deli, downtown Indianapolis: OK, so this isn’t a holiday attraction, but if you want to get a potato pancake for a nod to Chanukah, this is the place. The best Jewish soul food around for 200 miles (at least). Chicken soup with matzo balls, corned beef on rye, great fried chicken and more. There is a children’s menu with all the favorites, but the cafeteria style atmosphere makes this restaurant pretty kid friendly regardless. Open on Thanksgiving. Bring home some rye bread, bagels or other noshes. There’s also a location at the Keystone at the Crossing mall, but for the full effect, go downtown. We don’t visit Indy without a stop here. Mayberry Cafe, Danville, Indiana: In this picturesque town west of Indianapolis, there’s a TV-themed attraction you’ve probably never been to: the Mayberry Cafe. Complete with a police car parked out in front. This restaurant boasts of Aunt Bea’s homecooking, and I can personally vouch that you won’t leave here hungry. Make your kids watch a snippet of Andy Griffith on YouTube before you go so they get it. Very family friendly. 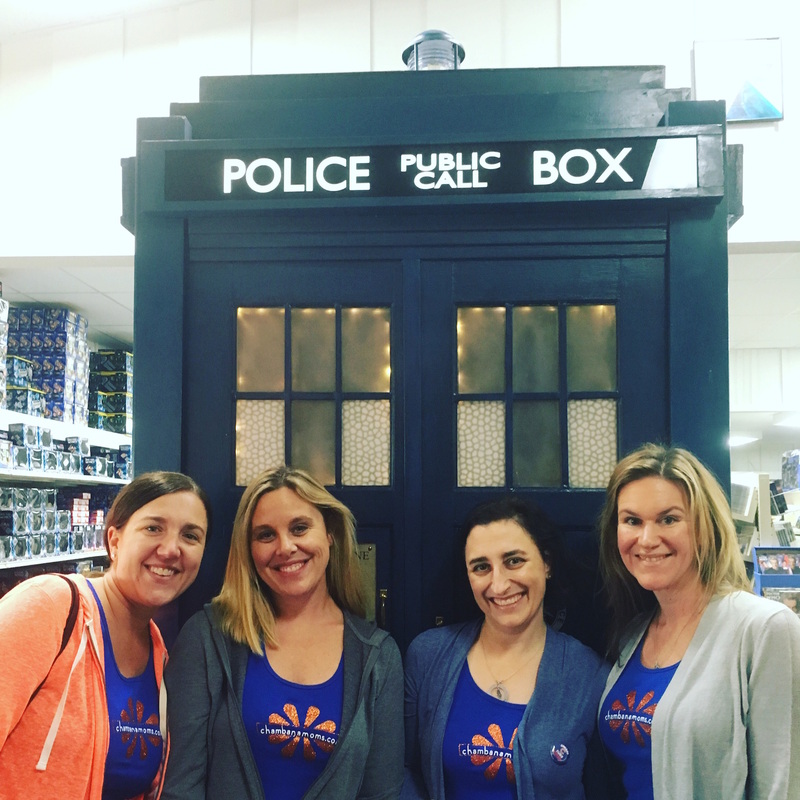 The chambanamoms team in front of the TARDIS at Dr. Who North America in Camby, Ind. Dr. Who North America, Camby (west of Indianapolis): If you have any friends or family who are Dr. Who fans, then make a stop at the largest Dr. Who store in North America. They even have a small “museum” area full of 50-plus years of Dr. Who memorabilia and some merchandise that can’t be found anywhere else. And yes, get your pic taken with the TARDIS. Closed Sunday and Monday, so make sure to plan your trip accordingly if you go. Chateau Thomas Winery, Plainfield, Indiana. If the adults in your party need a break from the kids, this is a great stop. Wine in Indiana, you say? Yes! Wine distinctive enough to make it into the gift bags at the Academy Awards, even. This wine shop has a tasting area and tons of cute gifts for the wine enthusiast in your life as well as the aforementioned famous Slender wine, which is carb-free. Just past the airport, this is right off of I-70.